Map of Kansas & Indian Territory and most of Colorado & Texas showing cattle trails from Texas to Oklahoma, Kansas and Colorado. Includes rivers & streams, the Staked Plains, state & territorial boundaries, forts, towns, and the Kansas Pacific Railway. The Chisholm Trail; L.B. Harris New Trail to Ellis; and Overland Cattle Trail for Colorado, Utah & California are also shown. 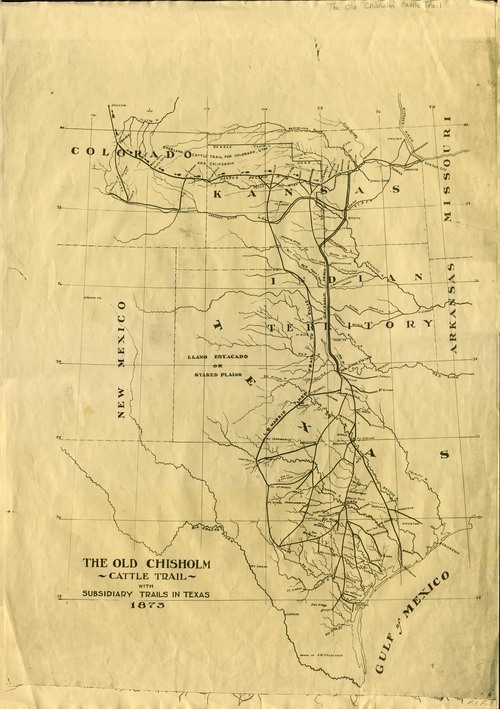 The old Chisholm cattle trail with subsidiary trails in Texas, 1873 / drawn by A. W. Ziegelasch.